A fund raising event for injured event rider Darren Chiacchia is being held next Wednesday, April 2, at W.C. Dover Farm in Florida. Chiacchia remains in a critical condition at Tallahassee Memorial Hospital since his accident on March 15 at the Red Hills Horse Trials. 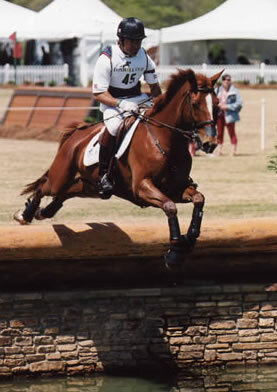 He was injured during the cross-country phase when his horse, Baron Verdi, hit a jump and somersaulted, falling on to his rider. Chiacchia, 43, suffered a head injury, multiple rib fractures and a partially collapsed lung. It was also discovered last week that a hand is also fractured. However, he has been showing signs of improvement, including opening his eyes, responding to voices and squeezing hands. The fund raiser is being held to help with Chiacchia's escalating medical costs, and donations can also be made to the Equestrian Aid Foundation. Chiacchia's family said they are hopeful Darrne will be able to be removed from the ventilator soon. * The Equestrian Aid Foundation in the US has set up an emergency designated fund in Darren Chiacchia's name. The EAF is a 501 (c) 3 non-profit organization. Its mission is to build a membership-based organization to assist everyone in the equestrian world suffering from life threatening illness, catastrophic accidents or injuries by providing direct financial support for their medical or other basic needs.